Here's something that sounds a bit (a lot) more upbeat from what I've been posting lately. Even when you're feeling down...I find especially when you're down...it's easier to write positive songs. There's no one in mind for this one except for a picture of someone in my future. With her comes hope and faith and the belief that there is still someone out there for me. I've given a nod to Bob Dylan here (buckets of rain), and I was hoping for a kind of JJ Cale sound...but it ended up a bit more upbeat than that. In the end, it's me. It's part of who I am and what I do. I'm still the never ending optimist...I believe that you are out there. Waiting for me. Somewhere...Have we met? Or is this going to come from a place where I least expect it? This has a bit of CCR feel to it. Really dig the song. Resteemed! Aw, Katrina...thank you so much! It means a lot that you get this. And, yes. You get back what you put out there, so why not try to be as positive as possible (although the sad stuff still will come through in the songs!). John Fogerty was always an important influence, especially in my years as more of a rock singer. I'm so glad you like this one! Heeey friend! as is used to be, sounds great. What an inspiration man!, you are writing very nice songs!. Thank you so much, my friend! I'm glad you enjoyed this! This composition is cool, Dino. I like the structure, simple but fair and pretty. It certainly reminds me a bit of Bob Dylan (not just for the wink ) and that makes it great, surely. Congratulations and thank you for sharing. Huge thanks, Fernando! I'm really glad you enjoyed this. Thank you for listening! Thank you! I'm happy that you enjoyed this one! que hermosa voz amigo , me gusta como cantas y tocas la guitarra gracias por compartir tu gran talento como quisiera verte en vivo. mucho paz para el alma. I cried a couple of buckets of rain, just a little bit, that nice composition friend, I like the reefs you achieved and the tone you used in the string tensioner, life will be nothing without love, and when one is in love, the muse is more than enough to compose a thousand songs. excellent voice and excellent look. Thank you for sharing your feeling. Thank you so much for the awesome comment. I'm very happy that you enjoyed this! Arriba, Dino. Éxitos a granel, hermano. Dios te bendiga. Thank you brother! Means a lot that you like this! Thank you for having this excellent forum for us to showcase our songs! I think it's easier to write about sadness. But when there is a strong motive that makes us happy, it is certainly easy to write something optimistic. It's great that you've made it easy to write something so good. It's a very good piece, friend. The arrangements of the song are very good. It feels good to hear the song. Only harmony, rhythm, fills your chest with hope. This part of the song "But now I have you and you have freed me My eyes are wide open Now I can see." It has made me value the experience that I am living with my current partner. Thanks to her I can now see, and it has saved me from myself. Bright, and beautiful handwriting. Congratulations. Greetings. This comment makes me most happy. You absolutely get it! And never take what you have found with your partner for granted. Always remember what makes it special and hold onto that, through easy times...and when times are hard. Thank you, brother! Thanks to you, for this excellent composition. I really understand the lyrics of your song. And I'm very happy to find her. Never let her go. And never take what you have for granted, my friend! Pris! Thank you so much! It can be so hard to stay away from the sad stuff...when a happier song comes along, I'm always grateful! Dino I missed this till now. I listened to it 3 times just now. It's so good. You don't just write songs, you build them from the deepest thoughts down all the way until the words float out into the blue. I really really dig this one. Good one, Dino... Nice, brother! Hey...thank you! Glad you like this one! you play the guitar very fluently, I used to play the guitar, but I was not very good at playing the chords, but it goes very well and you also write your songs, that's something admirable. I liked that you put the lyrics of the song inside the publication, I could read carefully and analyze its content, this fragment "now that I have found you my life will never be the same", it reminded me how feel peace and calm. Thank you for this great job you shared. Thank you so much! It means a lot to me that you took the time to really listen to this. I hope you'll come back for more songs from me! friend I congratulate you, very good interpretation. I really like the way you sing, you have a lot of talent. I would like to make a Spanish version of this beautiful theme, if you allow it. I would be very honored! And of course, I would love to hear what you do with this! Yes! Thank you! Thank you so much for your kind words. This means a lot to me! Thank you, Daniel! Much appreciated! Thank you for sharing and have a nice day! Many thanks! I'm glad you enjoyed this one! Thank you for your awesome words. I'm very happy that you enjoyed this. Best to you always! Wonderful song and wonderful voice!! Thank you so much. I'm happy that you enjoyed this! Thank you, brother! Much appreciated! Heeey Dino, I haven't hear you before. What a good song man!!. Good to hear you. Hey, man! Good to see you here. Thanks so much! Glad you liked this one. Your song is so refreshing, love the guitar melody too. The love that you reflect in the words is wonderful. Congrats! Yay...I am so happy that you enjoyed this! Thanks for your wonderful and kind words! Nice to see your interpretation. You have won a new follower. Congratulations!. success!! Thank you so much, Nancy! I hope you'll like what I do in the future! Thank you, brother! Glad you enjoyed this! Maravilloso que un equipo tan bien organizado vote por canciones genuinas y que tengan tanto contenido melódico y letras dignas. Voto por curie porque son geniales. 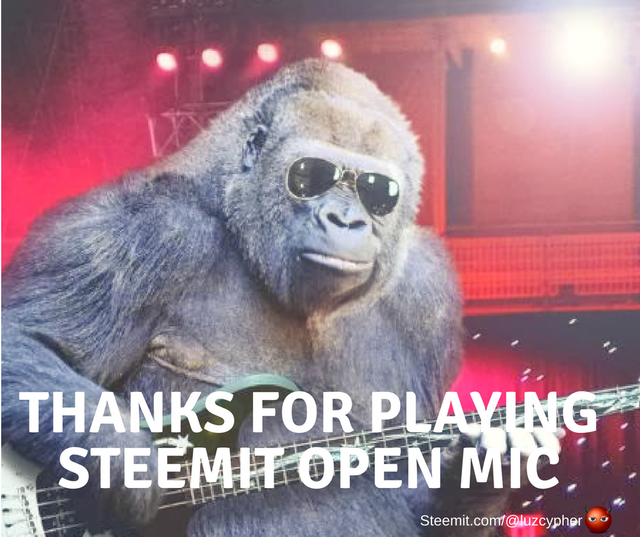 You just got a 2.01% upvote from SteemPlus!